I've always been drawn to jewelry sets. My father would bring me home lapis lazuli jewelry from his frequent trips to his homestead, Chile. Often, he would bring me a matching set and I would wear it proudly. In high school, among other things, I was known for having a good array of jewelry and for matching it to perfection. It was a compliment. Now, older and married into an old-world Greek family, I often receive matching sets of jewelry. My husband's first gift of jewelry to me was a necklace with matching earrings. Almost a year later, he bought me a necklace, earring, and bracelet set. His aunt and uncle bought me a necklace/earring set as an engagement present. When I got baptized this summer, my godmother (AND aunt-in-law) gave a gold cross that went perfectly with a pair of earrings purchased earlier in the year by my father-in-law. With the exception of the cross and matching earrings (because diamonds, gold, and precious stones are a rule unto themselves, dahling), I would never dream of wearing one part of the set without the other. And I always thought that was normal. However, back when I first started reading style and fashion blogs, I found out that it was "not well looked upon" in the blogosphere to match one's jewelry within a set. It's true! Some bloggers will eschew wearing a pair of earrings that they bought as a set with a particular necklace WITH THAT SAME NECKLACE in horror being too matchy-matchy. I didn't even know that was a problem. I mean, sure, I don't match my bag to my shoes. And I have no problem putting together separate pieces of jewelry in random ways. And I certainly have no problem wearing a gold bracelet on the same hand as my platinum engagement and wedding rings. But I can't imagine putting on, say, my carnelian necklace WITHOUT THE MATCHING CARNELIAN EARRINGS THAT CAME WITH IT. Maybe it's because I'm a little OCD? However, I don't think that being matchy-matchy with respect to jewelry comes off as stuffy or old-fashioned. It's all in how you wear it, as it is with most things, I guess. But today, when I wore black clothes with only turquoise accents, I felt pretty sassy. Hi there. That's me. Isn't the matching INSANE here? So, for the record, you see: one (but there were two) turquoise earring hanging from my ear, artfully matching my turquoise-accented cheap-o necklace, all tied together by my turquoise (and cream) scarf/wrap/dupatta. I held off on wearing my cheap-o turquoise ring and bracelet that I bought WITH the necklace because the ring turns my finger green after prolonged wearing and a school is no place for a ring with princess-y tendencies; I didn't wear the bracelet because I tend not to wear bracelets when I work: having something sliding on your wrist when you're writing on a blackboard does not lead to good times for me, I've noticed. 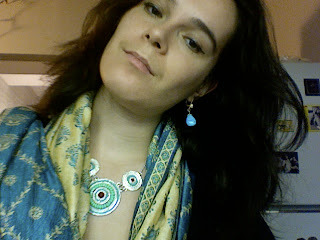 However, if I'd been going out, I TOTALLY would've gone full-on necklace-earrings-bracelet-ring-scarf. And it would've been magical.